The festival of Lord Ganesha is upon us and the city is ready to be immersed in the chants of Ganpati Bappa Morya and 10 long days of celebrations. From tomorrow, September 13 onwards the most awaited festival, especially in Mumbai and Pune, Ganesh Chaturthi or Vinayaka Chaturthi will commence, and the celebrations will be on for the following 10 days. Devotees have already geared up to welcome Ganpati Bappa to their homes and can’t wait to install (sthapana) the idol of their favourite lord. Ganeshotsav will end after 10 days on Anant Chaturdashi which is also known as Ganesh visarjan. In Hindu religion, all ceremonies are performed as per shubh muhurat (timings) and puja vidhi (rituals). To bring home the idol of Lord Ganesha, devotees must observe the muhurat and puja. If you are planning to bring home the idol of Lord Ganesha, we help you with the auspicious time and muhurat for Ganpati sthapana. 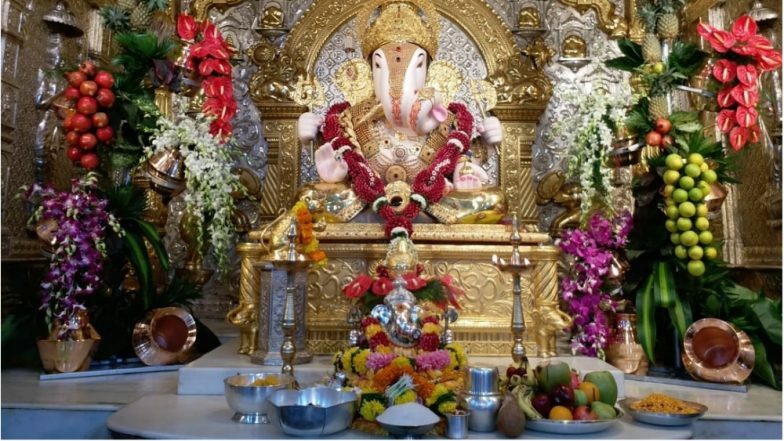 Ganeshotsav 2018 Greetings: Best WhatsApp Messages, GIF Images, Facebook Status & SMS to Wish Happy Ganesh Chaturthi on Lord Ganesha’s Birthday. Ganesh Chaturthi is a Hindu festival celebrated on the birthday of Lord Ganesha, the son of Shiva and Parvati. On this day and the following 10 days, devotees offer prayers and worship Ganpati. People bring home idols of Lord Ganesha and worship them for one and half, three, five, seven or nine days and then immerse the idol in water. Along with prayers, people also prepare special delicacies and sweets. It is believed that Lord Ganesha’s favourite sweet is ‘modak’ – a sweet preparation made of flour, coconut and sugar. There are several variations of modaks available in the market. Below find the shubh muhurat, sthapana timings and puja vidhi to perform on Ganesh Chaturthi. Ganesh Chaturthi Moon Sighting Prohibited: Why Should One Not See The Moon on Vinayaka Chaturthi? Know The Mythological Story Behind The Popular Belief. According to Drik Panchang, Ganesh puja is ideally preferred during Madhyana as it is believed that Lord Ganesha was born during Madhyana Kala. As per Hindu time-keeping, the time duration between sunrise to sunset is divided into five equal parts. These five parts are known as Pratahkala, Sangava, Madhyahna, Aparahna and Sayankal. Madhyana Kala is equivalent to midday according to Hindu division of the day. Ganpati sthapana and Ganpati puja on Ganesh Chaturthi are done during Madhyahna part of the day as it is considered the most appropriate time for Ganesh Puja. The sthapana (installation of Ganesha) should be done before 11 am on September 13 ideally between 6: am to 11 am. Once the installation process is done, devotees should perform the Ganesha puja. Usually when Ganpati is installed at home, devotees call pandits to do the sthapana and perform Ganesh puja as they are well-verse with the rituals. Lord Ganesha is worshipped with 16 rituals along with chanting of Puranik mantras during the Ganesh Chaturthi puja. The vidhi includes avahana, pratishthapan, asana samarpan (offer flowers), padya samarpan (offer water to wash feet), arghya samarpan (offer scented water), achamana (offer water), snana mantra (offer water for bath), panchamitra snanam (bath with mixture of milk, curd, honey, ghee and sugar), suvasita snanam (bath with scented oil), shuddhodaka snanam (bath with gangajal), vastra samarpan (offer new clothes), akshata (offer rice), pushpa mala (offer flower garland), durvankur (offer leaves), sindoor (offer vermilion), dhoop, Chandan karodvartan (offer chandan mixed with water), tambula samarpan (offer paan with betel nuts), narikela samarpan (offer coconut), dakshina (offer gift) and the last ritual is to perform Ganesh aarti. Two more days left for the madness to begin and to welcome Ganpati. The city will be brightly lit for the following 10 days. People bring in the Ganesha idol with famous dhols, music and dance. Although many are saddened to immerse the idol on the last day, but people show equal enthusiasm during visarjan with a hope in their heart that they will welcome the Lord next year. During visarjan the most popular chant is ‘Ganpati Bappa Morya, Agle Baras tu Jaldi Aa’ which means come soon again next year. Happy Ganesh Chaturthi!